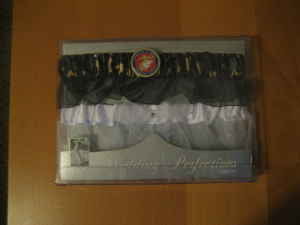 theAd>> Two Garters: A camo USMC one to keep and a white one "throw away" They are new, never been worn. $15 for the set. I'm not asking if you're not telling. Now first off, I would keep the white one and throw the other one away. But keep them both. I prefer matching my garters [much like socks] but practicality dictates a need for two. What marine is gonin' out on a hike with just the one silk stocking? Sheesh. I do find the camo confusing. Honestly, are you going be in the jungle and a one inch strip of your thigh is the thing that gives you away. When would that happen?